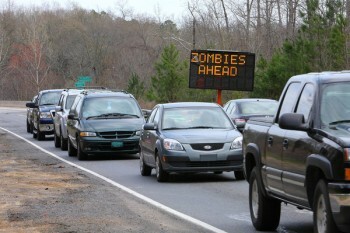 L4D Fans Reprogram Road Signs to "Zombies Ahead"
A gang of ne'er-do-wells in South Carolina hacked a pair of electronic road signs in the early hours of Sunday morning, reprogramming them to warn travelers to be prepared to stop for zombies. Those big, portable electronic signs that warn drivers about construction or other looming road hazards are a familiar sign to most travelers but the message flashing at drivers in Lancaster County, South Carolina on Sunday morning was a little unusual, to say the least. Instead of being warned about reduced speeds or workers on the road, Sunday morning commuters were told to watch out for "Zombies Ahead." The signs were put up to warn drivers about a road paving project scheduled to start on March 27 but somebody - Left 4 Dead fans, to be precise - got into them and changed their messages. How it was done is still a mystery; Lancaster County construction engineer Ken Wilson said, "It's my understanding that they would need a key to get into the box and a certain code to change the wording." Wilson and others on the project said they've never seen anything like this before, but fortunately they appeared to take it all in stride. The contractor handling the road work sent someone to reprogram the signs but didn't bother contacting police. "The message could have been a lot worse than it was," Wilson said. "In my opinion, it was a prank. They could have put something more sinister, something causing more panic." And how do we know the job was done by Left 4 Dead fans? The "Zombies Ahead" warning rotated to "Watch for Hunters," while the second sign read, "Be alert for Tanks."